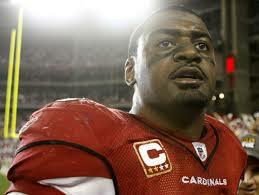 Cardinals linebacker and free-agent-to-be Karlos Dansby remains optimistic he will stay for the 2014 season, Darren Urban of Azcardinals.com reports. The Cardinals want him back. Why wouldn’t they, after he had a career-high four interceptions (two returned for touchdowns), 6½ sacks (second-best in his career), a career-best 21 passes defensed and was credited by coaches with 135 total tackles. But, after Dansby made $2.25 million last season, finding the right contract will be paramount for both sides. Dansby, not surprisingly, wants a raise and a long-term deal. General Manager Steve Keim will be careful not to hamstring his club as he works toward the bigger salary cap cleanup he has undertaken since being promoted. Under that framework, megadeals aren’t coming to players – even productive ones – who will turn 33 in November, as Dansby will. It doesn’t hurt that Dansby is already coming off an offseason of realization, after he was surprised in getting cut by the Dolphins and then finding a tepid market for his services. He didn’t sign his one-year contract with the Cardinals until May, after the draft. At the time, Dansby seemed to understand his circumstances within the league had changed.